I can not use Sesame Street images like "Cookie Monster" as they are trademarked images and it is illegal to profit from the sell of those images, but I can make items with the look at feel of characters like Cookie Monster. Then you can add books, stuffed animals and other items to your party decor to bring in the actual character. I recently worked with a new client to design items for her child's upcoming cookie monster party. She knew she wanted lots of different patterns and the colors blue (for Cookie Monster), brown and green. She is going to have cookies with milk so I designed milk bottle labels (including an ingredient label for the back of the bottle). 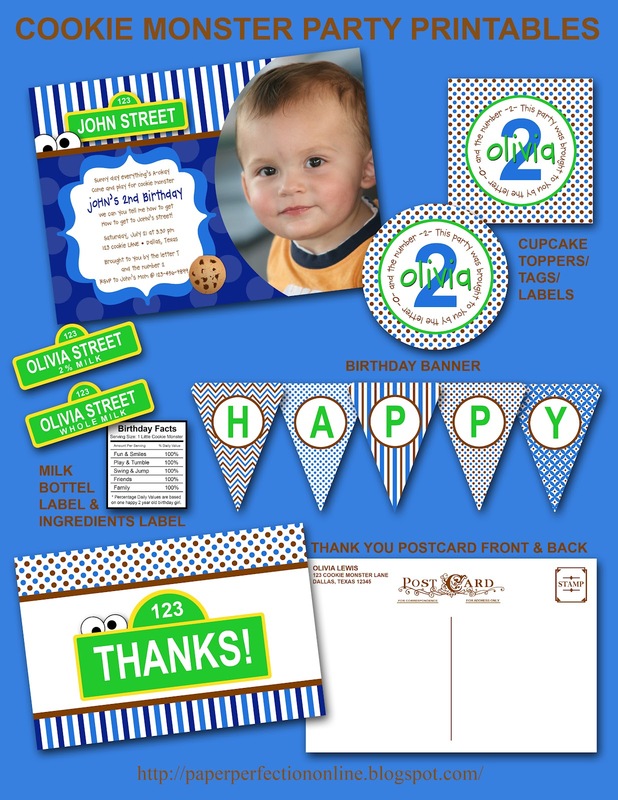 I also designed a few other fun items including a Cookie Monster invitation, birthday banner, gift tag (that can also be used as a cupcake topper or label) and a thank you card. If you are looking for custom party printables like these, contact Paper Perfection at jtanddolly@yahoo.com for pricing and details.